He definitely owns this ‘hood! What a delightful and unusual peacock shot, Carin. He walks with such conviction as if he knows exactly where he’s going! 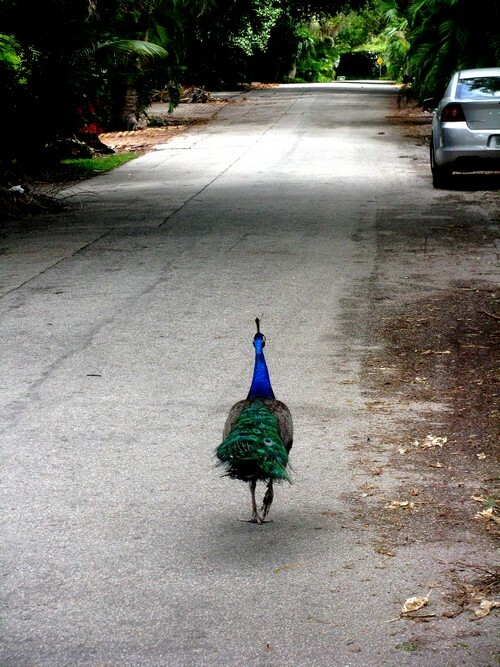 This is so funny – we’re on a peacocks theme today! I love the way this one is ambling down the road, shoulders back, bum swaying, just owning the day! What a lovely peacock, but they can be really noisy, they sound like they are saying helllllp! In Florida a couple of years ago I was amazed at how many there were wandering about different yards. I wondered: are they pets? guard birds?? mobile lawn ornaments? I don’t think I’ve ever heard one speak. “On the road again…” Oh, you made me burst out laughing Ms. Magtree! Oblivious of the traffic, away he goes. Owning the day indeed, as Allison says. Lovely picture! Is he a neighbourhood critter? I hadn’t thought of an accompanying soundtrack, but that’s perfect! And, yes, he’s a neighbourhood critter but not here… in Coconut Grove, FLA. The home of fascinating critters. Now that is a bird with Attitude. Love the composition — him in the middle of that long road (owning it), with just the solitary car showing in the top right in juxtaposition. His colours are vibrant — striking against the grey of the street. Is he on his way somewhere? Lost? I believe he works for NBC. These following are to be understood in two ways. I have printed this out and will study… Looking forward to some discussion! Can you remember what was the first poem that “opened up the possibility of poetry” for you? It was this poem, and a few others in those books, that made me realize there were many ways to tell a story. How wonderful and unexpected. I’m left wondering what circumstances could have possibly led this photo. I’d love to say I was walking past a building and saw this guy, but it’s an image from a documentary about a day in the life of Chicago. A really quite brilliant piece of film seen at the MOCA last month. I snapped a few shots in the dark… and these two turned out.